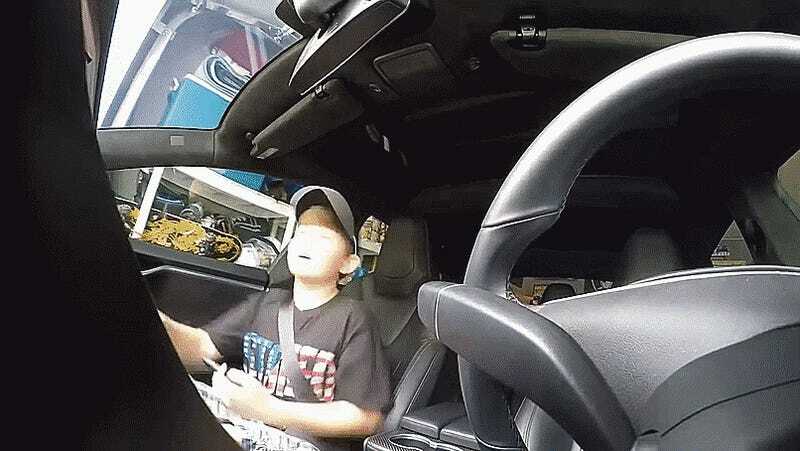 Tesla’s Summon feature has been rather contentious lately, but that didn’t stop one dad from using it to prank his son by locking him the car and making him think he was in a runaway death machine. Welcome to the future of dad pranks. To be honest this kid is way, way calmer than I would be if I thought my dad’s car had been suddenly possessed by the demons of hell chauffeuring me to my end in the luxurious carriage of death that is the Model S.
I’m guessing the kid knows that the car can already drive itself using the Autopilot system on the highway, but maybe doesn’t know about the Summon feature that uses the same sensors to pull out of the garage on command. Or maybe it’s faked. But maybe not. The “Dad’s gonna kill me” remark also makes me want to believe he thinks his Force powers have suddenly activated, like that VW Superbowl commercial. Sorry kid, we’ve all felt that crushing disappointment of learning we’re not, in fact, a Jedi.